and books that change us. WHY DO THE OHIO BLOGGERS GET TO HAVE ALL THE FUN? OK, Colorado kids' lit bloggers! I just finished reading a post by the Ohio bloggers- they couldn't go to the conference in Portland, so they went out to breakfast, then went book shopping at their favorite kids book store. Doesn't that sound fun? I want us to try it! Anybody else? 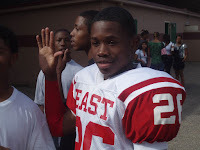 but THIS is my FAVORITE 26!!!!!!!! JOE SHERLOCK is another not new, but new-to-me series. Joe is a ten-year-old detective who charges his friends and neighbors $10 a day to solve their mysteries. Although Joe seems to get the job done, it's generally not without a few mishaps. I read Case #00002, The Neighborhood Stink, this week during Reading Workshop. In this book, Joe has been hired to discover which neighborhood dog is pooping on his neighbor, Mrs. Fefferman's, otherwise pristine lawn. In one hilarious chapter, he is staking out the yard and sits in an ant pile. Of course he has to take his pants off right there. He runs across the street in his Captain Winkie Boxers; his two evil sisters think this is hilarious and lock him out of the house. Joe decides to crawl through the dog door, but gets stuck halfway, still clad in only his Captain Winkies. The books are a little racier, and a little more Captain Underpants-ish than some of the typical series that are easily accessible to kids just breaking into chapter books. My fourth grade boys have devoured the first three and are begging me to make a trip to the bookstore to pick up more this weekend. I'm on a constant lookout for funny, scary, gross, and amazing books-- you know, the ones that even the most tentative readers in the class are dying to pick up. I've just discovered SHOO, FLY GUY and it's ABSOLUTELY PERFECT! Fly Guy is, you guessed it, a fly! He comes back from an outing one day to discover that his family and friends have gone on a picnic! Fly Guy sets out looking for them, and for his favorite food- brown, oozy, lumpy, smelly Shoo Fly Pie. Along the way, he makes several stops-- on something that is brown (but not oozy or smelly), something that is oozy, (but not brown or smelly), etc. The book is gross, and funny, and a total hoot! I'm thinking of the second, third, and fourth graders I know-- the kids who devour books about sharks, and dinosaurs, and skateboarding, and race cars, kids who want to take on the challenge of chapter books, and those whose JUST RIGHT books in terms of what they can read comfortably are titles like HENRY AND MUDGE, and FROG AND TOAD. FLY GUY is a series for those kids! And the best news yet-- this is a SERIES- there are four FLY GUY books! * Disclaimer: This is not a brand new series-- just a "new to me, new favorite" series! 3) It focuses on tough issues and could promote lots of great conversations. We definitely had one of those conversations on Friday. We're about a third of the way through the book, and as I finish the chapter, D'Anthony, one of my fourth graders, says, "So they're not that poor?" I'm surprised at this comment. I would say that Georgina and her family, homeless and living in their car, are very poor, but if I've learned anything in my 25 years of teaching, I've learned that there is usually logic, and often wisdom, behind kids' comments. "What do you mean, D'Anthony?" I query. "Well, they are kind of poor," says D'Anthony, "because they have to live in their car. They are not that poor, though, because they can buy coffee and M and M's." I'm still surprised. I ask the other kids what they think, is Georgina's family "totally poor" or just "kinda poor." Rodolfo thinks they are kinda poor. "If they were totally poor," he says, "they would not even have a car." Jackie, oldest of five kids, also thinks the family is only kinda poor, "Because they don't have to live outside, and because they have food to eat." Darlene and Tyree concur with the other members of their group. I am blown away. How can a family living in their car be only "kinda poor?" I suspect these kids have known days of "totally poor" and I am struck dumb by the lack of gratefulness at the abundance in my own life. I hope that the next month when things are tight, I remember that it's all a matter of perspective. Even in those times when I feel kinda poor, I still have a roof over my head, food, clothes to wear, and a car to drive. I can still buy M and M's and an occasional cup of coffee, not to mention a million other material blessings. Actually I am very, very rich. It's all a matter of perspective. I've been thinking a lot this year about the power books can have in kids' lives. Yesterday, Cynthia's Lord's blog made me cry (read the last item, about her visit to a school earlier this week). This year, I moved to a new school. And the kids' lives are really, really hard. Most of our kids are very, very poor. They come to school in shoes that have soles that flap, and without jackets on chilly fall mornings. They eat yucky cafeteria food for breakfast and lunch and ask for seconds, because they don't know whether there will be dinner at home. Every Friday, and especially at the end of the month, kids tell us they are going to a new school on Monday. At least once a week, a child tells a story that makes me feel like I have been punched in the gut, hard. I want my kids to know that they are not alone, that even though their lives are hard, they will survive, other people have walked through this too, and that they will be ok. One of the best ways I know to do that, is to share amazing books about people that have survived hard things. Right now, I am reading HOW TO STEAL A DOG to my fourth and fifth graders. They love this book, mostly, I think, because Georgina, the main character, whose family is living in their car, has a life so much like their own. This week, I ran across this poem, "Dear Author," in THANKS A MILLION by Nikki Grimes (Greenwillow Books, 2006). 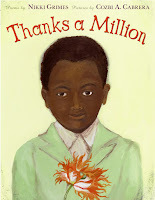 The book is a collection of "gratitude poems," a book I bought to help me remember to give thanks all year round. Somebody threw a switch and turned me off. I couldn't breathe. Or cry. I must be ok. But they were wrong. I leaked sadness everywhere I went. No one seemed to notice or undersatand. Until Lotus, the girl in your last book. She was also drowning deep inside. of that novel and hide for hours. The two of you made all the difference. Poetry Friday this week is at Biblio File. It's time for the annual Corn Maze Festival. Farmer Brown has big plans to build a Statue of Liberty corn maze, and has enlisted the help of all of his animal friends to complete this project. The chickens are building the fence around the corn maze. The cows are painting the barn. Only Duck is less than eager to help, and has to be threatened with the loss of his special-order organic duck food, if he doesn't help. As always, though, there is a twist. Each day, Farmer Brown sketches, measures, graphs, and mows. Each night, Duck, with the help of night-vision glasses and a glow-in-the-dark ruler sketches, measures, graphs, and mows. The end results are hilarious. 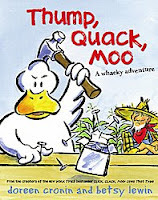 I bought THUMP, QUACK, MOO this afternoon, and read it to my boys at the dinner table tonight. My boys have absolutely no doubt that their mother is a total nerd, but secretly, they loved Duck's newest adventure! 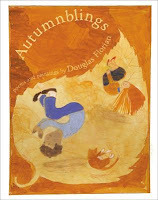 This is not a new book (it was published in 2003), but it's a new to me book, and it's just really, really lovely, perfect for this time of year, when there is just the beginning hint of fall crispness in the air, and the parks are dotted with football teams. "What I Love About Summer"
I can't wait until summer! I may have to buy this book! And I am definitely going to check out WINTEREYES and SUMMERSAULTS! Yesterday, I met a beer goddess. Isaiah and I were supposed to work from 10-6 in the water booth at the Taste of Colorado. When we arrived, we were told water was a slow venue and we would have lots of opportunities to wander around, see the booths, etc. About 15 minutes into our shift, Nicole, the tattoed, nose-ringed, purple-haired beverage supervisor and beer goddess, informed us that the other family from our high school had not shown up, and someone was going to have to help at the beer station. Let me back up a little bit. I hate beer- the smell of it, the taste of it, everything about it. In high school, when keggers were the big thing, I would go, take a couple of sips to look cool, then carry a warm beer around in my hand all night, just to look cool. In college, everyone told me I would acquire a taste for it. I never did. I don't think I've poured a beer since college. That's not entirely true. Two weeks ago, I had to work at a Bronco game at Invesco Field. I was a cashier, but the cashiers also had to pour beer. I was terrible. I tried to follow the directions on the "How to Pour a Perfect Beer" on the wall, but my beers foamed, overflowed, spilled. My 15-year-old food runner spent half, maybe even more than half, his time, mopping up beer spills. Afterwards, I emailed the person in charge of our Invesco fundraiser and said I was willing to help again, but could I please, please, please be a cook, or dishwasher, or anything but a cashier/beer pourer. But there were no beer pourers, and we were responsible for that booth, so I became a beer pourer. Nicole looked a little dubious, when I told her I was not very good at pouring beer. "Carol," she said, "let me show you. It's not really that hard." She adjusted her cigarette, and flexed her tattooed arm. "First you open the tap. Let it run until the beer hits the bucket. Then stick the glass underneath. Keep it tipped so the beer hits the side of the glass. The beer doesn't like to go far, so ya gotta keep the glass close to the tap. Now, when it starts to fill up, close the tap. See, ya got it. The perfect beer. Now you do it." I remembered my experiences from Invesco. Didn't think I really could pour a perfect beer. Really wanted to go back and hang out at the water stand. But I tried it anyway, while Nicole, cigarette dangling, watched. I opened up the tap. Stuck the glass under too soon. Got a glass of foam. "No," said Nicole, shoving the glass away. "Remember, the foam has to come out. Let it hit the bucket, then stick the glass under. "Just throw that one away," she said, as I attempted to redeem a glass that was three-fourths foam. The next beer, I concentrated on one thing- sticking the glass under at the right time, and sure enough, it made a difference. For the first few customers, Nicole poured the beer. I watched, and thought about opening the tap, and keeping the glass close because the beer didn't like to go far. Then Nicole said, "Can you grab this one for me?" And I did. And it worked. And I poured beers for eight hours straight. Hundreds of them. No breaks. And a few were foamy, but most were ok. Nicole had a seemingly endless stream of friends, who all had as many tattoos as she did, who showed up at the booth every 30 minutes or so. Every time a friend showed up, she would take a break. And I poured beer. By myself. And did just fine. So what is a post about beer pouring have to do with teaching kids to read and write? A lot I think. 1) Teachers have to be learners. We have to learn something new, I used to say at least once a year, but now I'm thinking every few months. We have to know the scariness of learning something new. 2) Teachers have to learn something outside their comfort zone. This blog has been a learning experience for me, but it's not a totally new thing. I already know how to use the computer. I am already a reasonably proficient writer. That gives me a safety net. Yesterday, in beer land, I had no safety net. And it was scary. 3) Teachers need to experience failure regularly, so we can understand the hearts of kids who come into our classrooms that history. Yesterday, as I walked over to the beer stand, all I could think about was how bad I had been at Invesco, and how embarrassing it had been. I really didn't want to try again. I suspect there are lots of kids in our classrooms that feel that same way. Then we wonder why they act out or shut down. 4) For some learners, information needs to be presented in more than one way and more than one time. The "How to Pour a Perfect Beer" poster on the wall at Invesco, had step-by-step pictures and explicit directions. I read the poster. I tried to follow the directions. I still couldn't do it. 5) Explicit verbal directions can act as a mediator for behavior. But not too many. Nicole was very explicit. Very concrete. Very succinct. Let the beer hit the bucket. Hold the glass close. Tip the glass. I repeated those directions over and over to myself, for about the first hundred glasses of beer. They worked. 6) It's ok to start over. My first glass was 3/4 foam. Nicole pushed it aside. "Just put that one down. We'll throw it out. Here, try again." Sometimes I think we work too hard to redeem a failed piece of writing. Sometimes, it would would be better to just start over. 7) Quick success is important for struggling learners. I knew I couldn't pour beer- I had experienced eight hours of continuous failure two weeks earlier at Invesco. I don't think I had the ego to fail many times yesterday. Nicole stood right there. Watched me. Monitored. I experienced success on the second glass. If I had failed more than a few times, I don't think I would have lasted at the beer booth all day. 8) Struggling learners need to feel needed. I was willing to try pouring beer was because there was no one else available. In our classrooms, that's not true. There is usually always someone around who can read or write. Struggling readers and writers don't feel like they are needed members of the community. I need to think more about how I can address this. Everything didn't go smoothly yesterday. The taps ran out and spurted beer more than once. At one point, there was too much air in the lines, and nothing anyone, not even Nicole the Beer Goddess, did, could get a decent beer. We ran out of glasses. But the day went ok. I survived. I poured beer. I'm ready to go back to Invesco for the next Bronco home game. And I will be a better reading teacher tomorrow, thanks to today's lessons from Nicole the Beer Goddess.